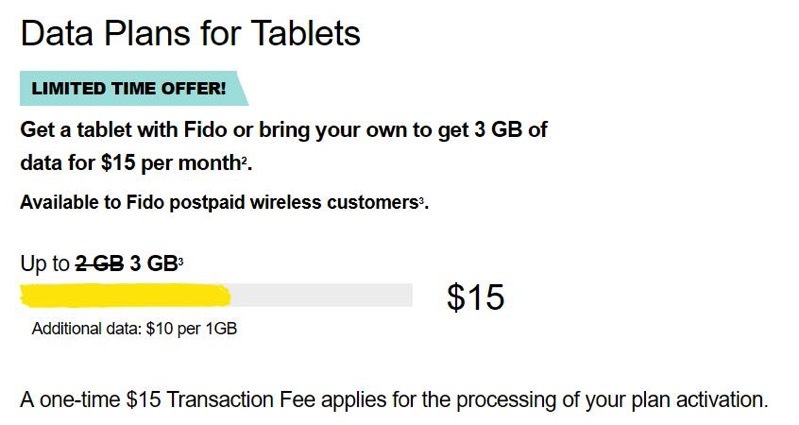 Rogers-owned Fido has brought back their promo which offers 3GB of data for $15 for tablet customers. Normally, the price is 2GB for $15, so if you’re the latter plan, call in to get your extra gigabyte of data. Also right now, Fido has the cellular version of the iPad Air 2 (32GB) on sale for $200 off at $439, or $18.39/month on a 24 month term. This is a decent deal, since Apple refurbished models are going for $529 for the 16GB iPad Air 2 (cellular), but if you buy outright from Fido, it’s brand new and it’s 32GB. Update: Apple’s iPad (5th gen) is also on sale for $480 for the 32GB model, which comes with a faster A9 chip; it lacks the laminated screen of the iPad Air 2 but overall the tablet will be snappier. Let us know if you’re going to be jumping on either of these promos! The data promo launched last week for Quebec but now it appears to have expanded nationwide.